One of my favourite designs is entitled "les domes celestes" ("the celestial domes"), whose patterns have an intrinsic harmony despite the apparent randomness of the forms depicted in it. As I came to discover and appreciate, many microorganisms mirror large ones that can reach spectacular dimensions - such as a human hair, which, under a powerful microscope, reveals striking similarities to a tree trunk - so it is not surprising (rather I find it fascinating) that the individual elements of this design are suggestive of the shells of exotic marine creatures, despite the celestial suggestion of the title. Yet, on closer inspection, this pattern reveals a mystery that even the initiated eye is in for a big surprise. 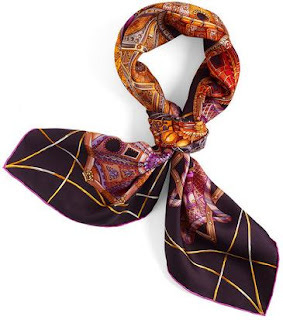 This scarf pays tribute to the architects, engineers and builders whose imagination, courage and perseverance in overcoming some of the highest technical difficulties produced legacies of utmost, arguably divine beauty. The design depicts eighteen cupolas - ceilings of chapels and palaces from around the world. The initiated eye can identify the dome of the Saint-Paul Saint-Louis church in Paris, the new synagogue of Szeged in Hungary, those of the great mosques of Cordoba and Constantinople, the church of Saints Peter and Paul in Krakow, and even the audacious triple dome of the sanctuary of Valinotto, near Turin. 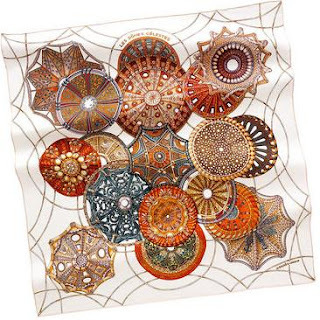 This scarf ties wonderfully, with the pattern revealing wonderful asymmetrical shapes, which are further enhanced by the "threads" that enrich the design, suggestive of a festive setting where such "threads" are hung from the ceiling in an elaborate decor. This colour combination in particular is quite impactful.